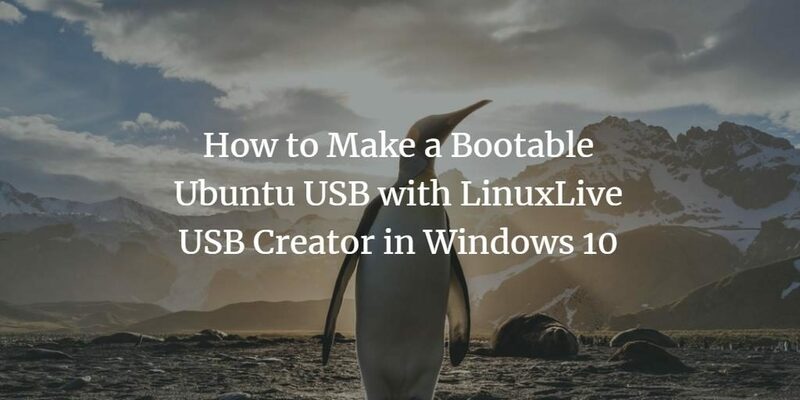 In this short tutorial, I'll show you how to create a bootable USB of Ubuntu 18.04 with LinuxLive USB creator in Windows 10 in 6 simple steps. Let's get started!! Step 1. Insert your USB device into your laptop or computer. Step 2. Open the LinuxLive USB creator. Step 3. Click on the drop-down "Choose a USB key" and choose the USB drive you just inserted. Step 4. If you have downloaded an Ubuntu setup ISO image file, click on ISO/IMG/ZIP. If you have an Ubuntu CD or DVD up, click on CD icon. Wait until the files files are checked. Step 5. In step 4 of the application (labeled with options), check "Format the key in FAT32 (this will erase your data!!)". Step 6. Finally, click on the lightning icon. Wait for the installation to finish. Now boot from your USB media right into the freshly installed Ubuntu 18.04.